There are many social layers at a Winter densite. Some of the most obvious are the clusters of large males here and there, each with several females that court and sometimes mate. Alongside all of this, are younger, smaller males that don’t seem to have figured out their place. They stay nearby, and spend the morning activity period moving around, trying to court females at the outer edge of each larger male’s area. Sometimes they succeed, sometimes they are chased away. Being chased away is the nature of most of the male/male confrontations that I have seen. The more familiar combat, where males stand up to fight eachother for dominance, I have actually never seen in its full glory. I’ve seen a lot of quick battles; mismatched males spending a few seconds to rise up, followed by a (relatively) high speed chase from the area. The young roving males seem to get it the worst in this case. 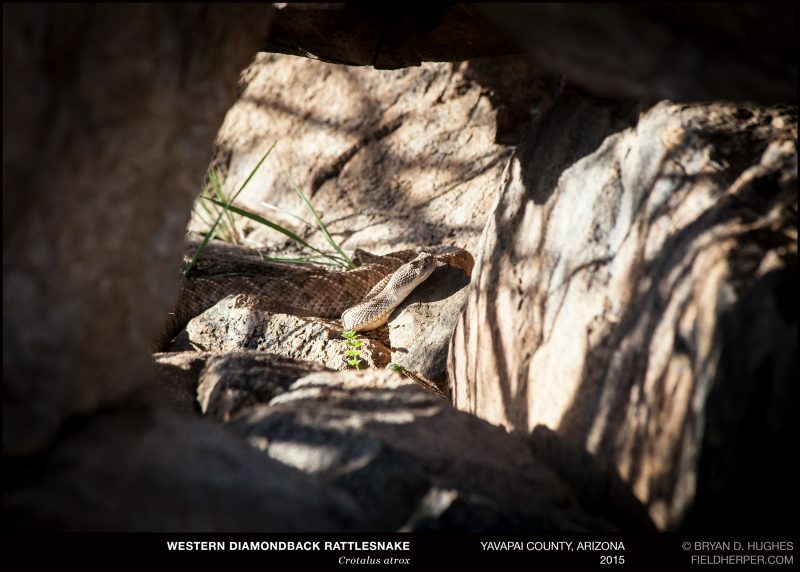 I have watched 2 of them (one was actually a Great Basin Rattlesnake, but a similar situation) off of high rocky ledges to the rocks below, and one off of a cliff, landing in a tree. Here’s one of my favorite examples of just how tough it can be to be one of these little guys. This little guy actually found a female to court, though in 2 days of trying, he did not succeed in actually mating. A big male shows up, chases him out and attempts to combat, and he flees to another rock. The problem, is that this rock is also taken, by another larger male, and the female he is trying to mate with … he is promptly chased away. Out of the frying pan, into the fire.. This entry was posted on Sunday, January 22nd, 2017 at 10:44 am	and is filed under Behavior, Field Herping, Research, Snakes. You can follow any responses to this entry through the RSS 2.0 feed. You can leave a response, or trackback from your own site.